These maps were created in 1981 to illustrate generalized land use/land cover in Massachusetts for 1951/52 and 1971/72, and change for the 20 year interval. The data are taken from a series of publications by William P. MacConnell of the University of Massachusetts at Amherst. The 104 detailed categories, which were identified and measured from aerial photography, have been aggregated into three basic ones: urban, open, and forest. Urban land includes most recreation and mining land as well as conventional urban types. Open land includes agricultural, pasture, and wetland, as well as other unforested non-urban land. Open water (about four percent of the state) is factored out of these three categories. 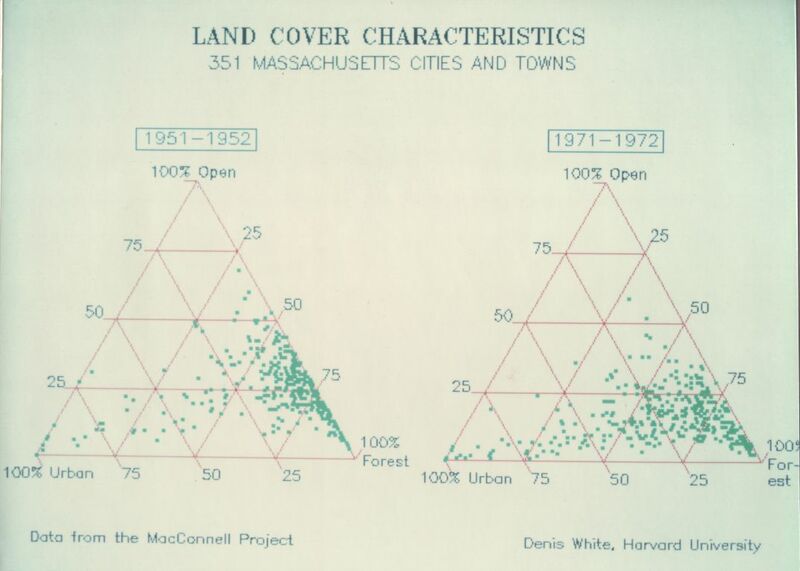 The percentages of urban, open, and forest land for each administrative unit (city, town, and county) locate it in a triangular contingency diagram, so called because any two values determine the third (the percentages sum to 100). These triangle diagrams are the basis for the color coded maps of all cities and towns. The color coding assigns relatively independent, highly saturated, hues for the maximum percentage in each category, so as to obtain a gradation of color mixtures for all possible percentage combinations. 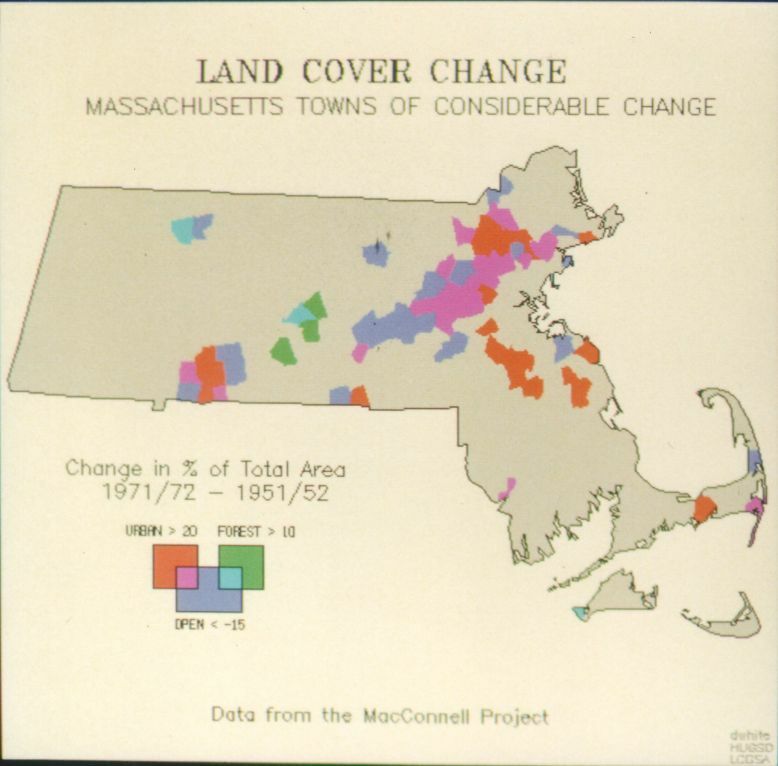 The change map also employs color mixing. Cities and towns with urban growth greater than 20% of their total area have a red component, those with growth in forest greater than 10% have a green component, and those with a decrease in open land of greater than 15% a blue component. Urban growth primarily at the expense of open land (as opposed to loss in forest, or both) mixes red and blue to get purple. Forest growth accompanied by a large open loss mixes blue and green to get cyan. 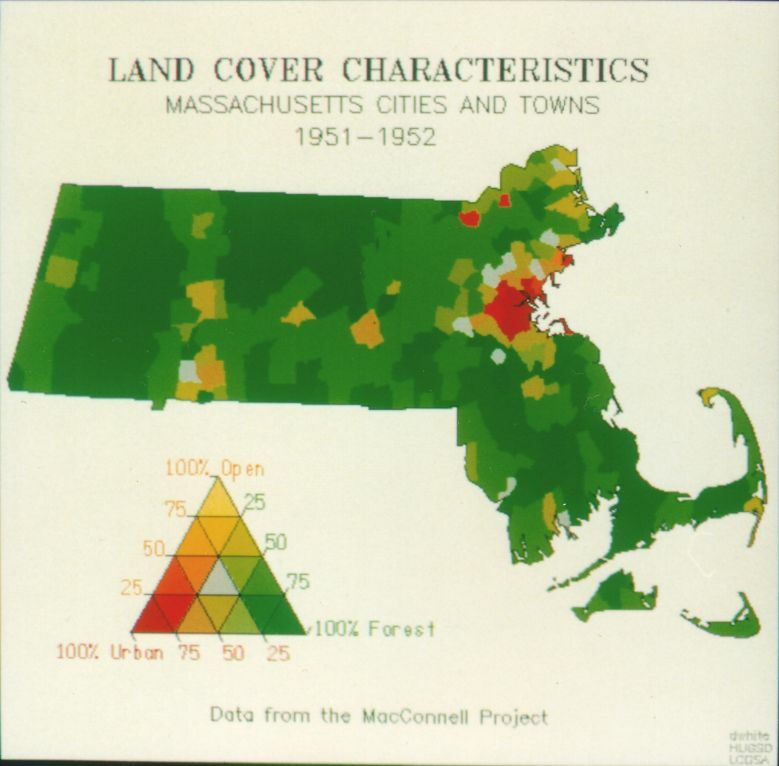 No places had both a large urban growth and a forest increase. These maps were created on an Advanced Electronic Designs 512 Imaging Terminal and reproduced on Polaroid 809 Color Print Film by a Dunn Instruments 631 Camera System. The 1950s map was published as Color Figure 28.1 in Robinson AH, Morrison JL, Muehrcke PC, Kimerling AJ, Guptill SC. 1995. Elements of Cartography, 6th edition. John Wiley & Sons, New York.